Editor’s note: This is a guest post by Richard Rinyai of TheProfessionalAssistant.net. 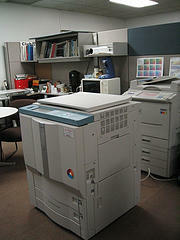 Do you have confidential documents that you need to send to your network printer? Do you not want to run back and forth between your desk and the printer to make sure that no one can see what you are printing? Ok, the last sentence sounds like you are doing something wrong at work (and you may be, which is obviously not a good thing), but you might be trying to print something that has sensitive information. There are times where managers ask me to print documents that have to be kept private either for a period of time or completely. Since I am at one end of the office (other staff members call this area “oblivion”) and the printer is on the other end, it makes it difficult for me to run back and forth. Most printers nowadays come with a simple function called the “Hold and Print” function. This allows you to print a document or several documents and asks you to enter a 4-digit PIN on your computer. Once you get a chance to go to the printer and want to release the one or several print jobs, you are asked to enter your pin for each job. The printer would usually specify the login ID and then enter your PIN. For example, mine would be my employee number. This way, I can only access my own print jobs and cannot unlock other staff members’ documents. Unfortunately, I can’t provide details of how this is done, since each printer’s functions are different. However, if you click File, Print and then click on Properties, you should be able to find this type of function, provided that your printer has it built in. If you’re not sure how this works, check with your IT department. This will help you and your staff members become more productive.